The Lafayette Parish School System is looking to tweak its school calendar for next year. 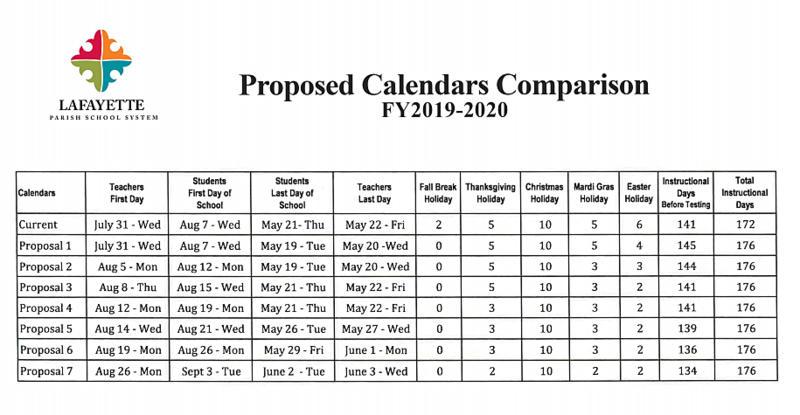 They are currently considering eight different school calendar proposals for the 2019-2020 school year. School officials say the idea is to not extend the year into what is now summer vacation while maximizing the number of instructional days the students have before testing. Each of the proposals will reduce the number of vacation days, however, the Christmas holiday will remain 10 days. The school board will consider approving a new calendar at its December 5th regular meeting. The options being considered are shown below.